The M-Course is a ‘M’ shaped course of a total length of 590 metres consisting of a starting buoy, three rounding buoys and a finish line. Competitors are required to swim underwater around the rounding buoys in sequence and cross the finish line within the time limit of 15 minutes 20 seconds. Competitors are ranked using a point scoring system for correctly rounding the three buoys and for course accuracy at the finish line. 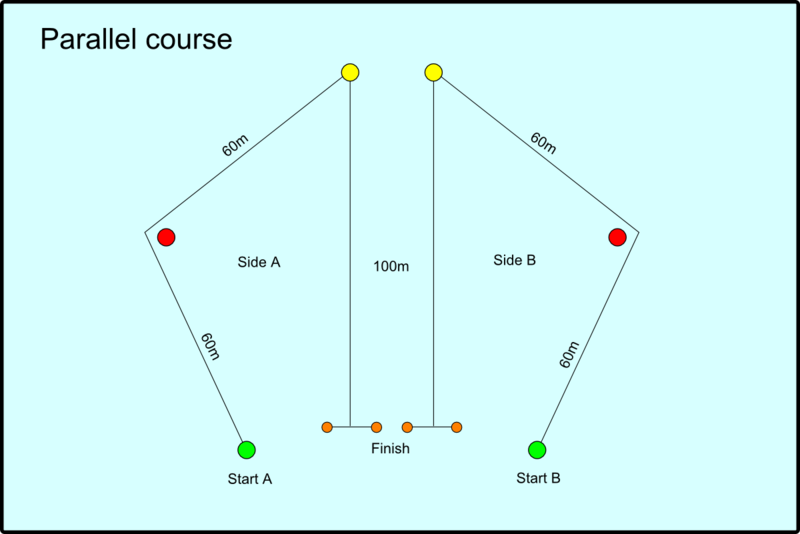 The 5-Point Course is a course of a total length of 650 metres consisting of a starting buoy and five orienteering points of which the last is the finish, all laid out in an irregular shape. 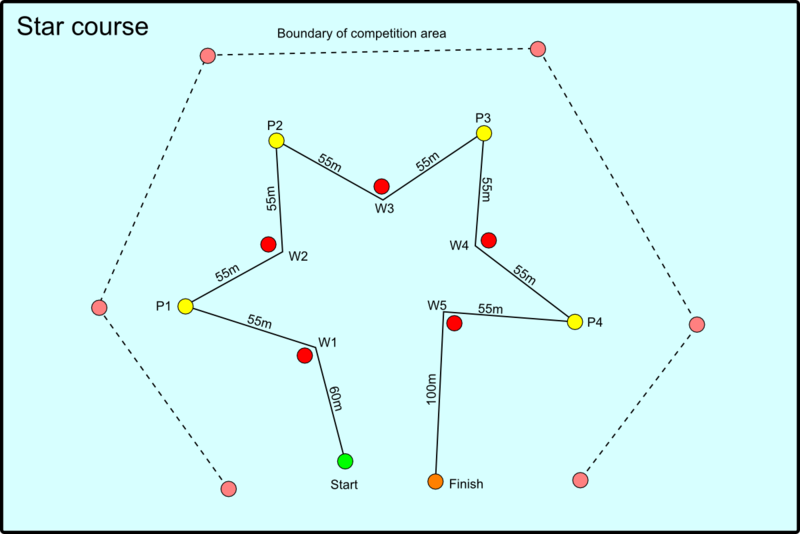 Competitors are required to swim underwater around the course in sequence and to confirm the discovery of each orienteering point ‘by clearly pulling or spinning it’. Competitors are ranked using a point scoring system for each orienteering point found and for the speed of the swim around the course. The Star competition is a star-shaped course of a total length of 600 metres consisting of a starting buoy, five rounding buoys and five orienteering buoys of which the last is the finish. 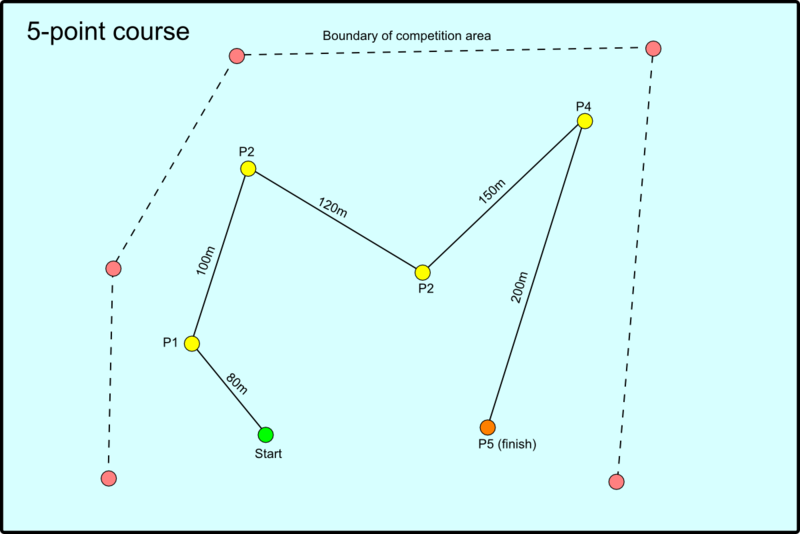 Competitors are required to swim underwater around the course in sequence and to confirm the discovery of each orienteering point ‘by clearly pulling or spinning it’. 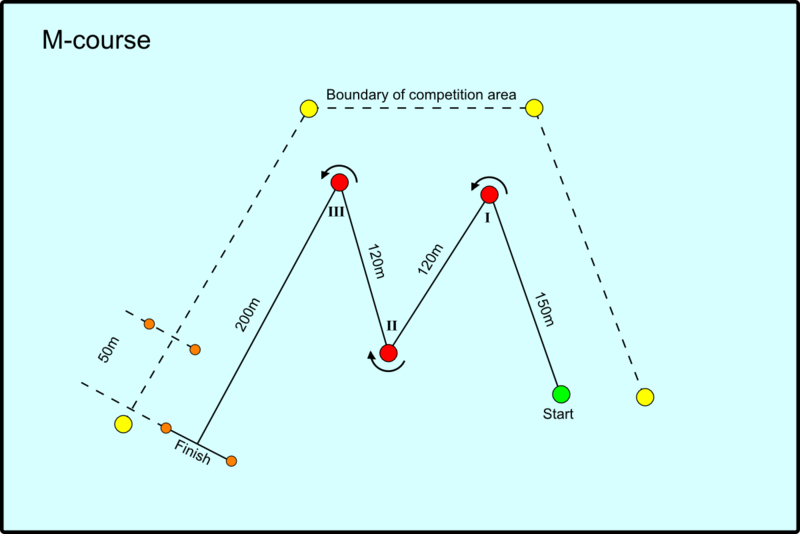 Competitors are ranked using a point scoring system for correctly rounding the five buoys, for each orienteering point found and for the speed of the swim around the course. The Parallel Race is a single-elimination tournament where pairs of divers from a pool of competitors usually numbered at 32 race against each other over five rounds until one competitor is left un-eliminated and therefore is the winner. 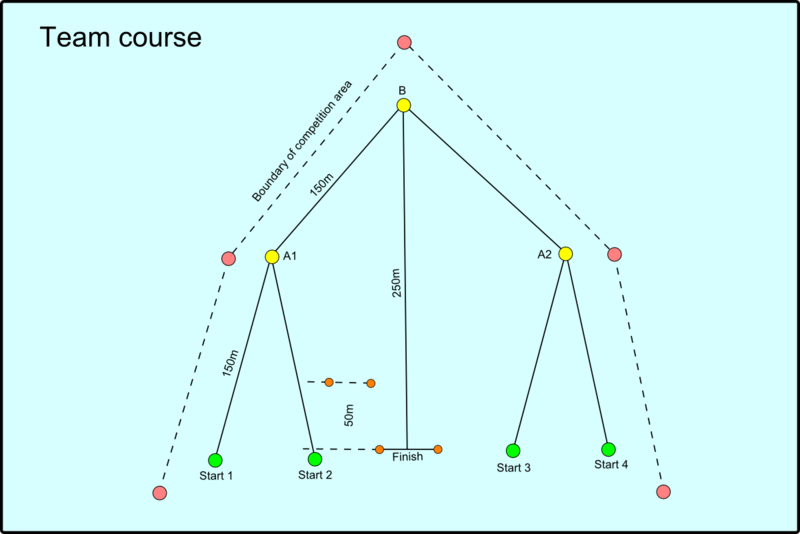 The course consists of a pair of two triangular-shaped courses (known as Course A and Course B) of equal overall length and located next to each other. 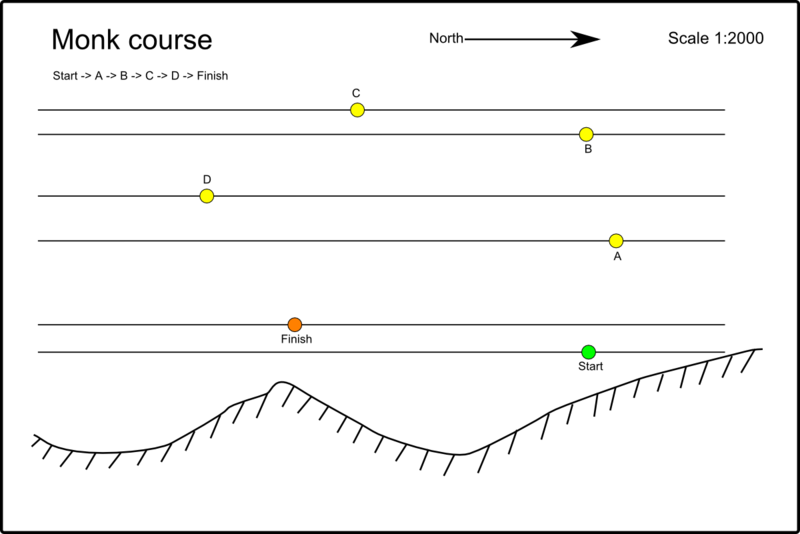 Each course has a total length of 220m and consists of one start buoy, one rounding buoy, one orientation buoy and a finish line of three to four metres width. The Monk Competition is an event where a team of two competitors is required whilst underwater to plan and then navigate from the start to the finish of the course via a number of orienteering points (also called control points) shown on a waterproof map provided at the start of the event within a maximum time of 18 minutes. The map contains details of the shore lines, boundary of the competition area, and the exact position of start, finish and the control points to be located. The course consists of one starting buoy and at least five control points of which the last to be located is the finish point. All of the control points with exception to the finish point are not visible above the water’s surface. The overall length is 650 metres with control points spaced at 100 to 150 metres apart. The teams are ranked using a point scoring system for the number of control points located and for the speed of the swim around the course. 'The Team event is an event where a team of three or four competitors start alone and progressively meet each other during the underwater swim within specified time limits and finish the course as a group within 15 minutes 20 seconds. Two variants of the event can be used subject to the water conditions at the competition site: Version A where the visibility is less than 2 to 3 metres and Version B where the visibility is greater than 2 to 3 metres. Competitors are ranked individually using a point scoring system for the number of orienteering points reached and for the speed and precision of the swim at the finish around the course, multiplied by a factor determined by the number of competitors completing the course.